The cleaning and maintenance of your septic tank can be expensive. 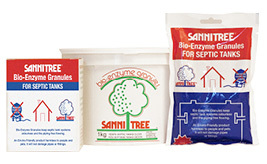 Bio-Enzyme Granules will prevent your septic tank and soakaway from blocking. It will also reduce odours. It contains enzymes, micro-organisms and bacteria which are not harmful to people or animals. It will not corrode fittings or pipes. It is fully bio-degradable and will enhance the performance of septic tanks and sewage disposal systems. Storage: 12 months if kept in a cool dry place. Enzymes: Lipase, protease, amylase and hermicellulase. Microbes: Bacillus subtilis, cellulomonas, aerobacter pH stabilisers and pollard.